She Stencils Her Ugly Floor Tile And Easily Gives Her Room An Incredible Facelift! If you’re tired of looking at that ugly old flooring that you’ve wanted to change for years, this is a simple but beautiful solution that will change your home up in a way you only dreamed of! An old linoleum bathroom floor can be boring and dull. When a full bathroom makeover is not feasible, adding a floor stencil is an easy and affordable way to perk up the space! Today I’m going to share with you a guest bathroom makeover that was enhanced with a stencil pattern. This woman had grown tired of the beige hue and dull linoleum flooring in her guest bathroom. Since new flooring was not an option, she took to Pinterest for ideas. She stumbled upon a stenciled linoleum floor project. That’s when she decided that using a floor stencil to makeover her floor was a great idea. She browsed our large collection of tile stencils and selected August Tile Stencil, from Cutting Edge Stencils. This beautiful pattern is based on traditional Portuguese Azulejos tile designs. After seeing this tutorial, I painted my bathroom tile! I love how it turned out. I ordered the same stencil she used in her project and black and white chalk paint to achieve this updated bathroom ceramic tile makeover. Now I have a Pinterest worthy bathroom on a budget for under $50. Watch the video for the before and after photos and step by step tutorial. 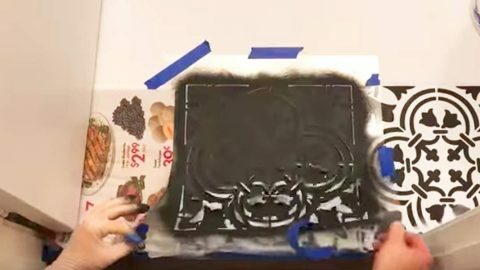 Watch how Someday Mama does this cool looking stenciled floor in her step by step tutorial and give it a shot yourself!